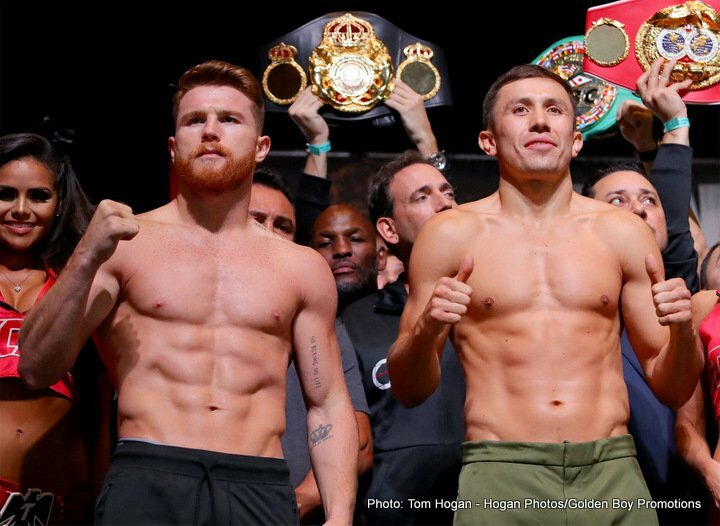 By Tom Hochbaum: As announced last week, Gennady Golovkin and Saul “Canelo” Alvarez will meet in Las Vegas on September 15th in a rematch for the Middleweight championship. If you are interested in the purse splits, titles stripped, tests failed, negotiations, or media posturing, do yourself a favor and skip this article. Boxing fans have been inundated with story lines surrounding this fight since the controversial decision of a draw in the first rendition last September. Meanwhile, breakdown of the actual fight seems to have taken a back seat. So it comes as quite the relief to hear each fighters’ camps announce that there will be no press conference or media tour for the rematch. The fighters seem to genuinely dislike each other at this point and the promotion requires little additional build-up ahead of the highly-anticipated rematch. To properly dissect the rematch, fight fans should first examine the first fight just as Canelo and GGG will surely do in their preparation. Most boxing pundits and fans scored the first fight in favor of the reigning champion from Kazakhstan. Fans were treated to a tactical battle of skill at the highest level of the 160-pound division. The bout played out as a more of a chess match than the firefight many expected, though. Why is this? In a word: Respect. Each fighter showed his opponent the appropriate level of respect and, at least initially, proceeded with a great deal of caution and tact. Golovkin seemed to be a bit stiff at the onset, possibly attributed to that fight being his first real showcase on the biggest stage the sport has to offer. Canelo was much more loose early, moving around the center of the ring fluidly, while sporadically letting his hands go with quick combinations. Many feel that Canelo was able to win a few early rounds on the score cards with his hand speed and head movement, making the slower and tighter fighter miss in space. Canelo is naturally the quicker boxer. Alvarez came up as a pro in the lower weight-classes of welterweight and junior middleweight where speed is essential. He is also an adept counter puncher due to his superior reflexes, hand speed, and timing. Canelo knew, though, that quick counter shots alone would not deter the widely-feared GGG forever. It appeared that he focused his training on adding size and power in preparation for the first fight. Canelo anticipated that he would need to have more strength behind his counter shots to keep the ever-pressuring Golovkin off of him and at a safe distance. Canelo bulked up considerably during his power training, and thus may have sacrificed some of his conditioning. It appeared in the middle rounds that Canelo’s endurance had become an issue. Golovkin was able to impose his will on the Mexican star by walking him down behind a stiff jab. Canelo frequently found himself with his back to the ropes, looking for opportunities to counter while Golovkin scored and won round after round. In the second fight, Canelo will need to fight for the full three minutes of all twelve rounds, while still packing enough on his punches to make Golovkin think twice about walking him down. GGG possesses what is widely-considered to be the best jab in the sport. He utilizes his jab in a variety of ways to set up his offense and even to neutralize his opponent’s attack. He throws more jabs per round than just about anyone in boxing, so it shouldn’t have come as a surprise that he leaned heavily on this punch against Alvarez. Something that did take many observers by surprise was Golovkin’s caution in throwing the big, finishing hooks he is famous for when he had Canelo against the ropes. Golovkin undoubtedly respected Canelo’s counter-punching prowess and showed more caution than many were used to seeing. GGG wisely sensed that Canelo is proficient at setting traps and could have been lying in wait for Golovkin to open himself up and walk into a huge counter shot. The middleweight with the highest KO % in history basically abandoned his body attack and maybe wisely so. Hooks to the body, while extremely effective in Golovkin’s typical fights, could spell trouble vs a known counter puncher with the skill of Canelo. Body shots take time and require the offensive fighter to lean into the punches, leaving them very vulnerable to counters. Often mislabeled as a slugger or brawler due to his constant pressuring style, Golovkin is actually an intelligent fighter with sound footwork rooted in quite the amateur pedigree. While GGG seemed risk averse in his attack (relatively speaking), the first fight was still a fantastic bout. Though lacking in an abundance of obvious fireworks, the fight appealed to fans of the sweet science due to the first class skill employed by two pound for pound stars. Using what we learned from the first fight, it would be logical to predict that Canelo’s trainers, Eddy and Chepo Reynoso, will encourage him to utilize space, speed, and movement to win the rematch. The trainers seemed frustrated that their fighter was so frequently opting to fight with his back to the ropes. They know that allowing Golovkin to walk Canelo down and back him into a corner is a very dangerous game. They watched their fighter frustrate GGG with head movement and land effective combinations while boxing him in the middle of the ring. If stamina was the issue which caused Canelo to sit back on the ropes, it would also make sense to assume the Alvarez camp will focus far more on conditioning this time around rather than strength training. Alvarez alluded to this already, suggesting that he would be training in high altitudes prior to the cancellation of the rematch which would’ve taken place on May 5th. It is hard to believe Golden Boy CEO Oscar De La Hoya when he says that Canelo will be more aggressive in the rematch. Fans need to remember that as a promoter, it is Oscar’s job to sell the fight. Casual sports fans don’t want to hear “Canelo is going to utilize head movement to frustrate Golovkin for 12 rounds and win a decision”, even if that is the more probable and advisable strategy. Team Golovkin learned quite a bit during the first few rounds last September. Golovkin seemed to go to school immediately and make appropriate adjustments mid-fight. Trainer Abel Sanchez has proclaimed multiple times that he does not adjust his fighters’ training based on their opponents. However, GGG knowing that he shouldn’t expect Canelo to simply stand and trade with him should make a difference early. Round 13 should not look the same as Round 1. Golovkin learned that he was able to walk through Canelo’s best shots. Alvarez landed some absolute hay-makers cleanly on Golovkin’s chin multiple times in the first fight. Armed with the knowledge that he can take those shots from Canelo, GGG should be confident enough to turn up the pressure early. Adding to this, Canelo will presumably focus less on strength training and may sacrifice some power to build his endurance, making it even less likely that GGG will be discouraged from stalking aggressively. It will be very telling if Golovkin commits to any type of body attack early on. Both men are talking as if their mutual adoration has gone by the wayside. If the respect which assured the first fight would be a chess match has also faded, boxing fans can expect an all-out war for as long as it lasts on September 15th. Golovkin feeling confident enough to apply extreme pressure early will lead to many potential counter opportunities for Alvarez. If Alvarez is truly angry and opens up his offense, using his hand speed to throw blazing combinations, Golovkin could be goaded into a firefight in the center of the ring. Both men have excellent chins, neither ever coming close to being stopped in their careers. All of this could to add up to a pugilistic powder keg…or not. Maybe we see two excellent athletes at the top of their sport plying their trade just as they did in the first fight. Either way, the rematch will be can’t-miss action for boxing fans around the world.